I went to one of the web sites hosted on my server today and a blank page was shown. Found in the forums a way to view PHP errors and the errors below is what is shown. I have 2 Joomla web sites hosted on the server and they both have the same problem. The other 6 sites on the server are fine. No changes have been made to the web sites, the PHP configuration, Apache server since this problem. I reverted to a backup PHP configuration file of a few months ago, same with Apache config file, and this did not fix the problem. I've tried all of the solutions in the forum but can't fix this problem. I can't figure this out... Please help! Running Fedora 10, Apache 2.2.14, MySQL 5.0.88, PHP 5.2.9. Joomla version 1.5.7. I'm having the exact same problem. A server reboot did not solve the problem. I'm suspecting PHP 5.3 is the cause, but even upgrading to the latest 1.5.X of Joomla! did not solve the problem. Any insight out there? Same on easyPHP site. Others have reported the same errors. No replies. add a semi-colon to the beginning of the line. This term, if you're not familiar with it, is called rem. "rem the line out" or shut it off. In most .ini files it is a semi-colon. It may be a slash (/) or double slashes (//) or you may have to rem it out in some php.ini files on some servers with the /* <code is here> /* syntax. Shut error reporting off. It worked for me and allowed my joomla site to show up. Where do I find php.ini? I am having a similar problem and can't really find any answers or assistance other than this. It happened to me when upgrading to 1.6. Is there some way to go back to the previous version so my site can still be up until I figure out how to fix this? Veofasgard wrote: Where do I find php.ini? I am having a similar problem and can't really find any answers or assistance other than this. Perhaps this enlightens you as to which file they are referring to. I changed error_reporting but its not working, any diffirent solition? I noticed no one has posted any solution to your problem. Did you figure out a solution yourself? I have the same problem and I'm not having any luck fixing it. Just let me know, if you have a moment. If app is not defined before please define app before calling. it probably overrides your php.ini rules. almost forget,.. my problem comes up after i used j51_oxygen template. Thanks a lot for your solution that help me a lot. When I migrate my PHP version from 5.5.2 to 5.5.24 a lot of "Strict Standards: Non-static method" are appeared on my site. I modified my files to have a correct encoding with the PHP 5.5 methods. thanks a lot to all for these contributions. Thanks scorp2000! That helped me and worked perfectly. Joomzilla wrote: Thanks scorp2000! That helped me and worked perfectly. This also works in Joomla! 2.5.20 except the setting is in Global Configuration >> Server >> Error Reporting, I set mine to "None". 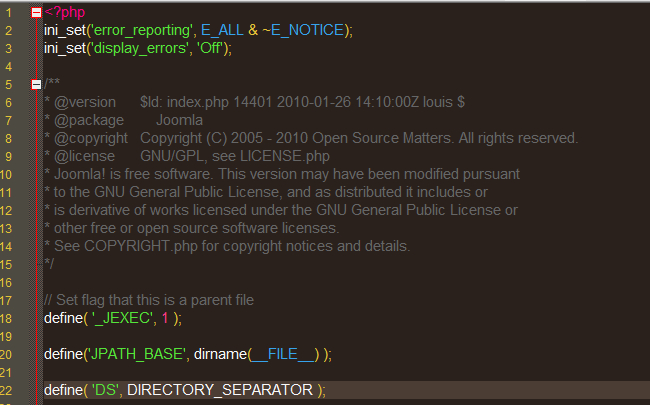 help, i have open template folder and index.php file but i cant see this lines! If the PHP on your server has been updated, this issue can happen. On my old Joomla 1.5.20 website I had this problem. Discovered that the PHP had been updated on the server from 5.3 to 5.4. Joomla 1.5.20 is not compatible with PHP 5.4 or 5.5. Solution is to have PHP 5.3 (or earlier) reinstalled. This will make the PHP.ini file compatible again.